At Your Dressmaker, we understand the careful planning and the excitement involved in the creation of a period wedding, which is why we place an emphasis on quality and style in each of our designs. Whether you wish to join with your beloved under a medieval banner, or exchange your vows at a Celtic handfasting, we have beautiful gowns catered to match your chosen theme. 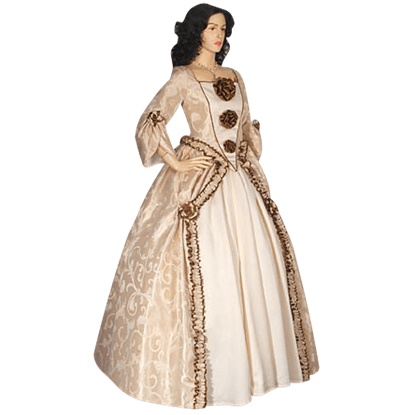 For the fair lady of the Renaissance age, we offer elaborate gowns with wide skirts. For the bride who feels more at home in a medieval village, we feature an assortment of country and maiden dresses. Perhaps you wish to create a mystical atmosphere. Our ritual robes will add a magical touch to the setting. If you wish for a wedding that celebrates Scottish traditions, tartan dresses are among our unique, yet authentic, designs. Maybe you prefer other genres such as steampunk and gothic, we possess gowns, capes, and dresses fitting for these themes. 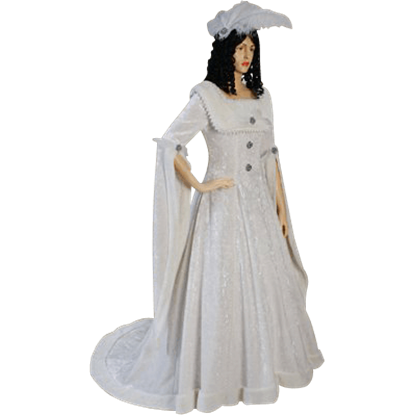 As you browse through our selection of historical bridal apparel, take note of the high quality and customization we offer. Whether you prefer a cloak made from luxurious velvet or a fur-trimmed hooded dress, we feature these designs and more. Our skilled team of tailors will assist in the celebration of your joyful union by crafting the bridal gown of your dreams. 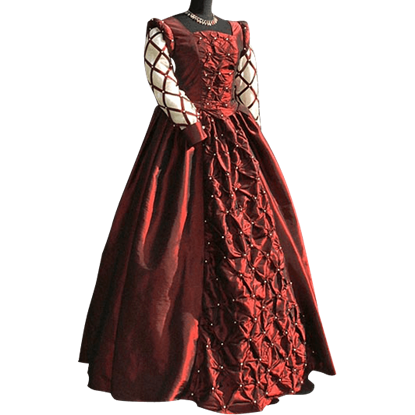 The Burgundy Fair Maidens Gown is made from a red high quality velvet fabric with silver trim. 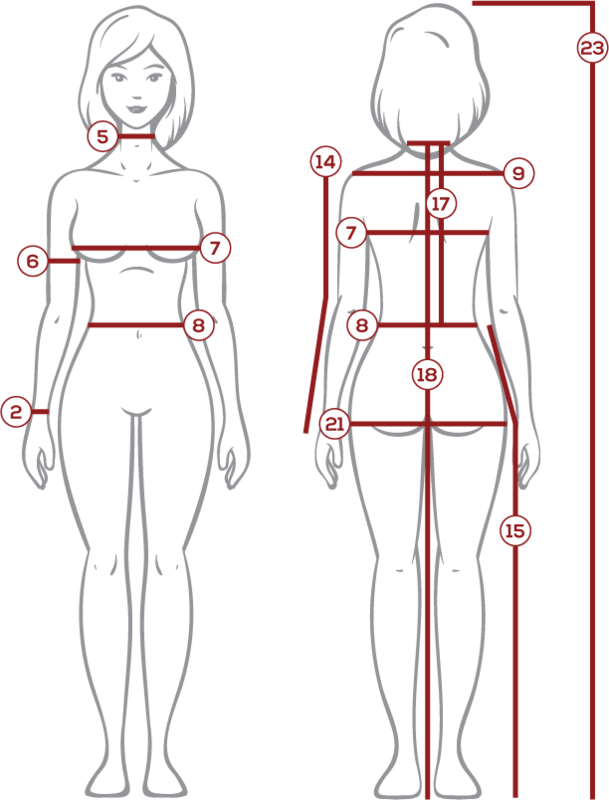 There is lacing on both the front and back of the dress which can be adjusted to fit your figure. The Burgundy Medieval Ball Gown is a charming medieval gown that has over 150 pearls embroidered into it. The Burgundy Medieval Ball Gown closes with laces in the back. 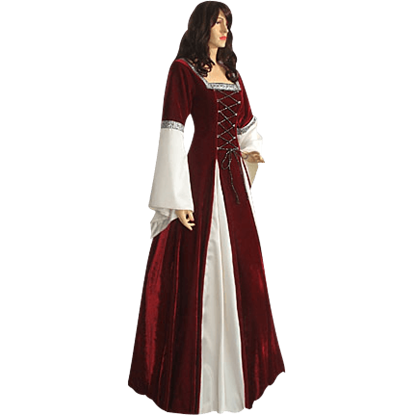 This Burgundy Medieval Ball Gown is great for Medieval Weddings. The Cailin Scottish Ensemble looks like it came right from Scotland. This two piece dress ensemble includes the white under gown and the green plaid over gown. 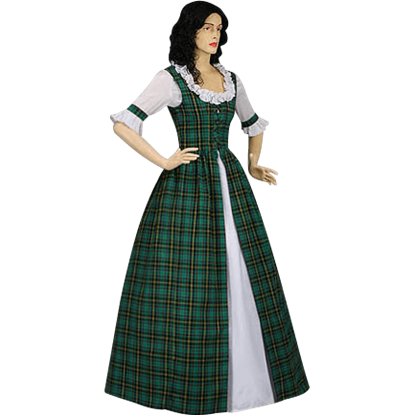 The over gown is made of a high quality tartan fabric. Saying that the Crushed Velvet Renaissance Dress in White is impressive is something of an understatement, this dress is nothing short of utterly gorgeous. Words and pictures only say and show so much about how impressive this dress is in-person. 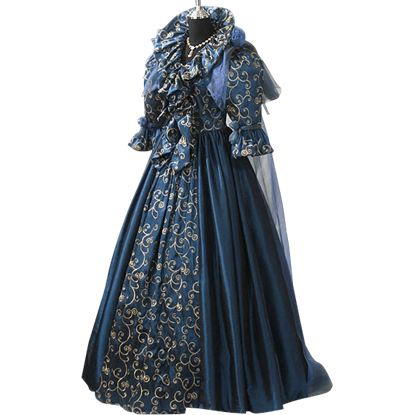 The Dark Blue Fair Maidens Gown is made from a dark blue high quality velvet fabric with silver Trim. 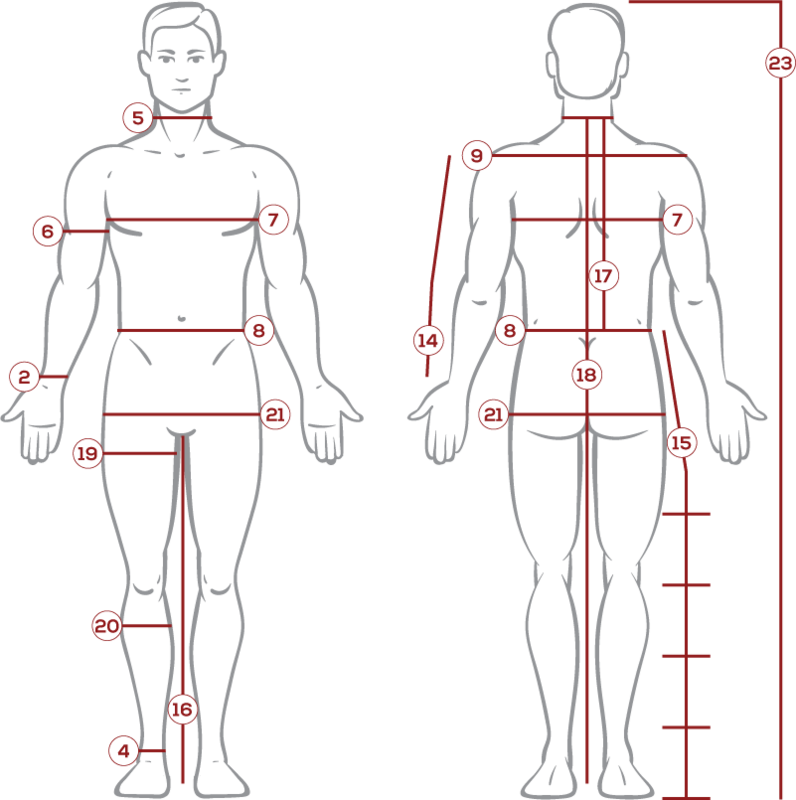 There is lacing on both the front and back of the dress which can be adjusted to fit your figure. 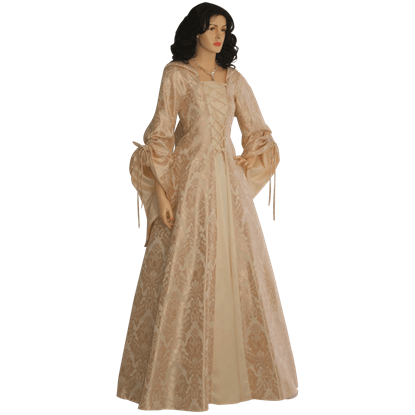 The Elven Queen Dress is made of a very silk polyester fabric with long sleeves. The Elven Queen Dress is a one piece dress that closes with a zipper in the back. The dress has 2 blue roses on the shoulder and a veil on the back. The Fairytale Princess Gown is made of a very nice baroque brocade fabric and is fully lined. The Fairytale Princess Gown is a one piece dress that closes with laces in the front and back to ensure a perfect fit. The Feathered Renaissance Dress is simultaneously a simple yet exotic dress that features a near-peerless beauty alongside incredible quality, this dress is made from quality materials and is designed to be the perfect picture of decadent elegance. 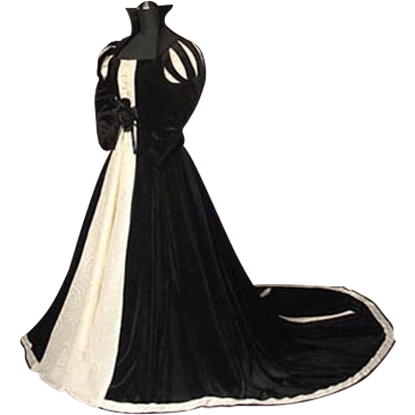 The Formal Medieval Wedding Dress is made from a black high quality velvet fabric with white baroque damask. 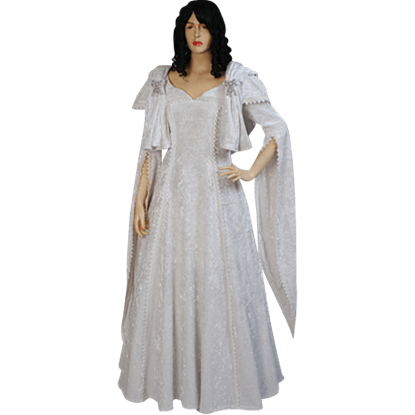 This Formal Medieval Wedding Dress is perfect for Medieval Weddings, Renaissance Fairs and Medieval re-enactments. The Formal Renaissance Gown is a two piece dress ensemble consisting of a bodice/over-skirt and skirt. The bodice and overskirt are made in a cream color baroque damask fabric. 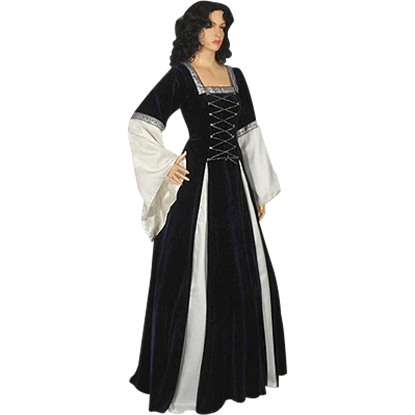 The Formal Renaissance Gown is great for Renaissance Fairs. 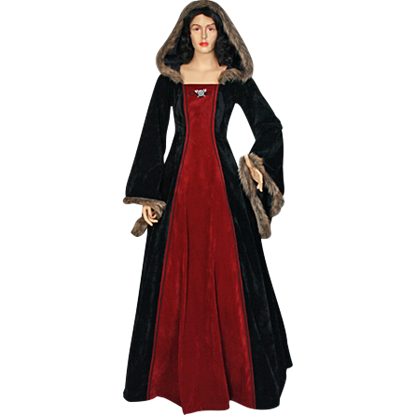 The elegant and attractive Fur Trimmed Medieval Dress with Hood will keep you warm during the cooler seasons. Made entirely from a soft suede textured fabric, this dress features the soft feeling of suede without any excessive weight.